Ferries are being urged to watch their speed in a Scottish loch where a father and his two sons died in a boating accident. The advice was issued by the Marine Accident Investigation Branch (MAIB) in its report into the incident. 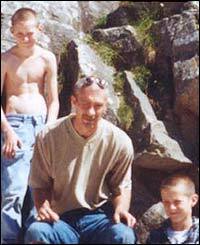 Shaun Ridley, 37, and his sons Steven, 15, and Michael, 12, from Leigh, died in July last year. 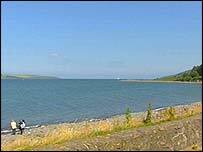 The MAIB said the cause of the wave which swamped their boat in Loch Ryan, Dumfries and Galloway, was not clear. The report said that the vessel had been vulnerable because it was overloaded, modifications to the hull had reduced buoyancy and its engine was poorly maintained. The 4.6m long boat sank near Lady Bay after a large wave shorted the battery, stopping the bilge pump and engine. The MAIB report said that a ferry sailing nearby created waves which overcame the vessel four minutes before she was finally swamped. Mr Ridley died while trying to save his two sons, who were wearing the boat's only two life jackets. He and his son Michael were still alive when a lifeboat crew pulled them from the water more than five hours later, but they died in hospital. Steven's body was recovered six weeks after the incident. The boys' grandfather Brian Ridley, 61, and family friend Harvey Haughton, 58, survived by clinging to the upturned hull until they were spotted by a passing yacht crew. The MAIB's report said passenger ferry operators like P&O and Stena should consider if any of their vessels "have the potential for operation within the critical speed range with respect to wash generation". It recommended that ferries' deck officers "should be made fully conversant with critical speed wash production and the associated inherent dangers". Coastguard agencies were advised to erect signs reminding those using small boats of the dangers from the wash of passing vessels. The MAIB also said the Maritime and Coastguard Agency (MCA) should ensure that harbour authorities are aware of the hazard created by "dangerous wash" from ferries. Transport Minister David Jamieson said there were "very serious lessons" to be learned by ferry operators, the MCA and boat users. "Prompt action by all the agencies involved will minimise the possibility of future incidents of this kind," he said. He added that the MCA had already improved its staff training, especially for coastguard watch managers. The MAIB blamed a ferry for a separate accident on Loch Ryan last year in a second report published on Thursday. A vessel sailing from Stranraer to Belfast created a wave that swept a boat ashore at Lady Bay in September, damaging the vessel and injuring its owner. The report recommended that Dumfries and Galloway Council install new warning signs.